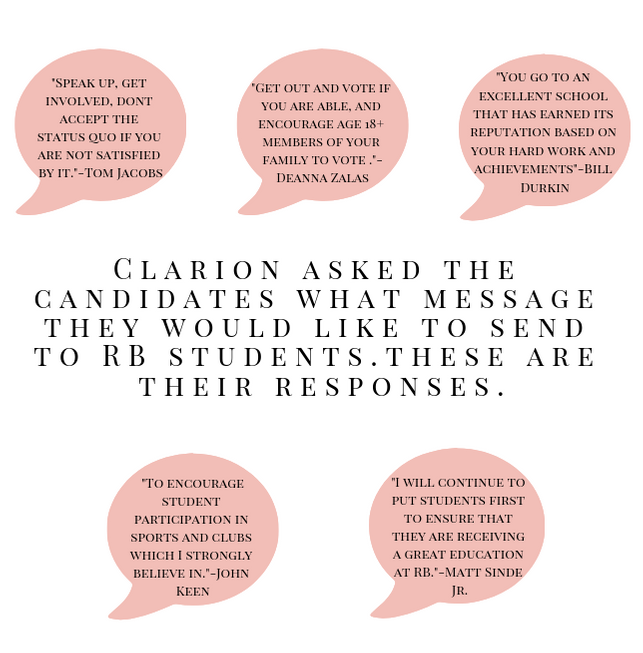 The Clarion recently published multiple quotes from candidates in the upcoming school board election in our March 20 hard copy. Below are the complete responses from candidates to our questions. To see more, check out page 2 of our most recent hard copy. 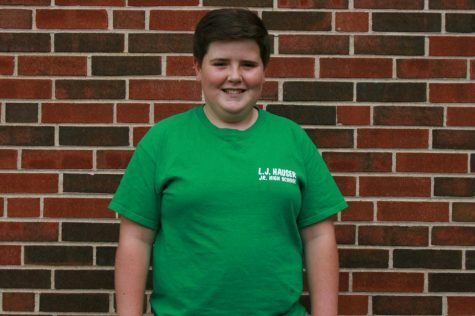 Why should students care about the School Board Election? Thank you for asking this – it is a critically important question with a pragmatic answer and a highly consequential one. The pragmatic answer is that the School Board Election exemplifies how our representative system of governance works. This is important for students to understand. We elect people and give them the authority to make decisions on our behalf. Most of those decisions on the RB board have to do with setting policy on how to run the school so that it provides a high-quality education while keeping the financial household in order. But what if some of these decisions, or lack thereof, will affect students down the road much more than the people making them? That leads to the consequential part of the answer. In light of our times, I believe the school board needs to be more engaged on broader issues that will significantly affect the student’s futures. What I am talking about is the existential threat posed to students, and humanity at large, by global warming. The world’s scientists agree that we need to cut our emissions in half no later than 10 to 12 years from now. If we don’t, we risk irreversible damage to the climate system. Unless we act with decisive speed and scale, climate change threatens to rob students of their futures. We are facing a real emergency, and students know it. But are we – the parents, teachers, administrators, and community members – doing enough to prepare them for this reality? Are we doing enough to prepare you so you will become the transformational leaders we all depend on? And are we doing enough to show you that it is entirely in our control to reverse the effects of global warming and that by doing so, all of us will benefit – financially, in terms of human health, and environmentally? I don’t think so. That is why I decided to run for a seat on the Board. High school students don’t have a way to formally participate in the decisions about systems set-up until they graduate. Only at age 18, when they become fully enfranchised through their right to vote, do they have a voice that counts. I plan to vigorously represent their perspective and long-term interests on the board. What message would you like to send to students at RB? Speak up. Get involved. Ask questions. Don’t accept the status quo if you are not satisfied by it. As hard as it is to admit, the truth is that my generation has failed your generation by not adequately protecting your futures. We must be honest about it and ask you for your help in correcting this situation as fast as we can. The place to start at RB is with a greater commitment to civics education. From the moment I first heard it until today, Dwight Eisenhower’s driving insight from his days as President of Columbia University has shaped my perspective on education. He said that “the true purpose of education is to prepare young women and men for effective citizenship in a free form of government.” I believe this is as true today than when he said it. I think there are opportunities both within the curriculum by strengthening the current civics class offerings and through clubs and direct student initiatives. Already, one of the promising outcomes of my run is the formation of #DemocracyLive, an ad-hoc grassroots group of students who have started meeting regularly to follow the board election and to discuss the pressing issues of our time by asking questions. Questions like is your voice heard? What makes us good community members? What worries you? When will you act? When I talk about the future leaders we all depend on, that is who I mean. It is all of you – with the necessary dose of courage. That is why I am proposing that we embrace a Culture of Courageous Leadership at RB for students to know we want them to speak up and lead, for teachers to inspire and challenge all students, for parents to demand civics excellence in addition to academic excellence, for taxpayers to invest wisely to save everyone money long-term, and for grandparents to cast votes for their grandchildren’s futures. What do you hope to get done while on the school board? In my professional work with Loyola Academy, a private college preparatory High School in Wilmette, I have experienced first-hand what school community aspiration, commitment, pride, and strong leadership can do to the quality of a school. I believe there is no reason our public high school shouldn’t be equally high-performing – it will be more challenging to get there, for sure – but why not start with the question of how far we want to go together? I would like to launch a broadly inclusive community visioning process for RB, one that re-calibrates our aspirations by committing to prepare our students for lives of transformational leadership and positive impact. The first step towards this would be to gain the support of the board, however, the extent of community support of a visioning process will be the determining factor if and when this happens. 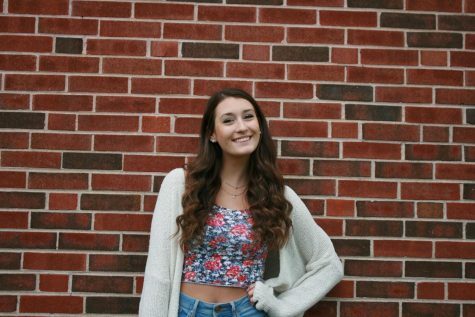 If all RB community stakeholders – students, teachers, administrators, parents, and taxpayers – buy into the idea that we should set our sights high, it is in our grasp for RBHS to become a national leader in the debate about how best to educate our young women and men in times of massive change. This will drive better educational outcomes, attract the best teachers, and make the district more sought-after, all while having beneficial effects on property values. What do you think is the biggest issue facing RB? Potential complacency in moving forward. Depending on the election outcome, the RB community might be satisfied with the current successes of the school and content to stay away from addressing the broader issues facing our communities. Please don’t get me wrong – RB is a well-managed school with a deep history and good educational results, but the true potential, as outlined in my answers above, lies in adapting a more ambitious attitude. What do you think the responsibilities of the school board should be? School board responsibilities are well codified and appropriate and include setting the vision and goals for the district, adopting policies that give the district direction to set priorities and achieve its goals, hiring and evaluating the superintendent, and adopting and overseeing the annual budget. As elected officials who represent their constituents, school board members should also function as highly effective communicators between members of the community and the superintendent. I believe their highest value is to coalesce an over-arching vision that allows all stakeholders to feel heard and taken into consideration. This gives them the broadest possible range of ways to positively contribute to a jointly defined, better future. The Board is entrusted to lead policy and fiscal management efforts. From advocating for sound rules at the State level to the more localized support of general education, arts, music and athletics, the Board is responsible for fulfilling its obligations in a transparent, ethical manner. RBHS is a very good school and the elected Board needs to ensure a focus on both continuous improvement and the smart use of resources. As a member of the District 208 Board, I would support a strategic planning effort to address operational and capital priorities and allow for an informed discussion between students, parents, residents, educators and other people with an interest in the success of the school. Residents of Brookfield and Riverside should be proud of the school in our community, and actively engaged in making decisions around its future success. Get out and vote if you are able and encourage the age 18+ members of your family or household to vote in this and every election. At the last school board election municipal election in 2017, 26% of eligible voters cast a ballot; in 2015 it was only 22%. That being said, turning 18 is not a magic switch for civic responsibility. We all need to be informed on the issues facing our respective communities so that we can engage in civil, constructive debate. Because the District 208 Board sets the policy direction that allows strong educators, dedicated administrators and qualified support staff to lead all students to fulfill their potential. What do you believe is the greatest issue facing district 208? The current Board and administration have worked diligently to stabilize the fiscal outlook for District 208. However, there are numerous uncertainties that cannot be strictly forecast, including the state of the economy, the impact of local property tax assessments and state legislation related to pension requirements. The Board of Education must focus on planning for and ensuring the future stability of the district. To be tireless advocates in overseeing the best possible balance between being fiscally prudent and supporting the needs of the students, staff, teachers, parents and each community within the district. Things seem well run however if there are things that can be done better, then that has to be reviewed and considered. What do you hope to be done while on the school board? To assist in continuing and maintaining the academic and program excellence and reputation of the school, students, teachers, and staff. What message would you like to send to the students at RB? You go to an excellent school that has earned its great reputation based on your hard work, involvement, and achievements. The administration, teachers, staff, coaches, your parents, families, friends and communities have all had critical roles in this excellence. As you get older and send your children to RBHS, it is imperative that the current and future Boards continue the right direction for not only today’s students but also those in the future. It’s an opportunity for students to become an active voice for both their needs and the faculty/staff and to urge your parents or families to become more involved as a strong community school impacts the entire district in so many ways. Your views and input are important and necessary, and you should feel comfortable in expressing opinions to those who are serving as in various leadership or board roles. This is no different from most other school districts in Illinois. Funding will continue to be a challenge. The school board can only act as a unit, each member has a vote. The Board hires the superintendent, sets goals, and adopts policy. We approve all hires as recommended by the superintendent. We also have the responsibility to approve all expenditures in the interest of the taxpayers. We approve the collective bargaining agreement with the teachers union. We also vote on student suspensions. What message would you like to send to students? One of our current board policies is to encourage student participation in sports and clubs which I strongly believe in. Another goal is to encourage an environment that promotes academic achievement and college readiness. I am a 1979 RB graduate so I can relate to the student experience, and many Board members have students at RB. What would you say is the biggest issue facing our district? The biggest issue facing our District is financial: most of our revenue is provided by local taxpayers in property taxes and this is capped by the inflation rate and increases about half a million dollars a year. The State has serious budget problems so we cannot count on increases in state aid unless the economy improves. I would encourage the Board to measure student academic growth as these metrics become available. We would focus on the changes in student performance rather than just absolute achievement. The role of the school board is to govern. The school board hires an administration which manages the school to ensure that our students receive an excellent education. Continue to ensure that RB provides the students and community a great education and the tools needed to be successful in their future. Additionally, help those students who feel that college is not the path that they would follow after graduation. I would like to coordinate with the area high schools and local community colleges to develop a credited program for the Applied Arts. This plan would provide a possible future path for these students to create interests and expose them to college. In my previous term our focus was the student to provide the tools and programs that will help to meet their needs for a successful future. I will continue to put the students first to ensure that they are receiving a great education at RB. A strong school board helps to provide the administration with the tools needed to help our students succeed. The school board has a fiscal responsibility to ensure that the school has no monetary issues. The ability to understand the needs of these growing demographics by providing educational support, new classes and extra-curricular activities targeted to those students. We need to have administrators that have an understanding of this diversity which will allow them to help our teachers and school make them feel a part of the school not an outsider. Finally, we must support the student both internally and externally by providing outreach programs to those student’s families. This is a super cool article. Great job, Liam!